Sagamore Racing had a thrilling week, with three of its two-year-olds finishing in first place in each of their respective races. The week began with a victory by Give No Quarter in Race 2 at Presque Isle Downs on Tuesday, September 17. In his second career race, Give No Quarter finished in 1st by 22 ½ lengths. 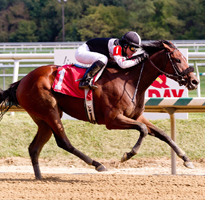 Daring Dancer followed with a win on Thursday, September 19 at Laurel Park, coming from behind to win her first race ever by 2 lengths in Race 7. The Sagamore Racing streak continued on Friday, September 20 as Naïve Enough broke her maiden in Race 6 at Laurel Park for Sagamore’s third consecutive victory. She finished 1st by 7 ¾ lengths.